When searching for ideas to build out the interior of a gourmet food shop in Bangkok, Architectkidd came across a community of carpenters in the nearby slums utilizing scrap wood from shipping pallets to make small items and knick-knacks. Architectkidd was impressed with their resourcefulness as well as their carpentry skills and hired some of them to build out the interior of the shop, which happens to be in an upscale part of Bangkok. The resulting project is an interesting collection of simple, stackable wooden boxes called “Klong Toey Boxes”, named after Klong Toey slum where the workers came from. It may seem a little odd to hire carpenters out of a slum to build the interior for a gourmet food shop, but in a sense, that was exactly what Architectkidd was going for. They were interested in juxtaposing two very different ways of life within one project – luxury lifestyle society combined with migrant working class. 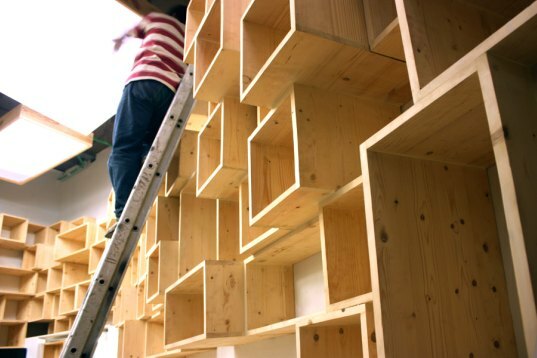 The workers were consulted for their expertise in building with scrap and found wood, and a collaborative idea resulted: outfit the interior with simple, stackable boxes made from wooden pallets, which were easily found around the city. 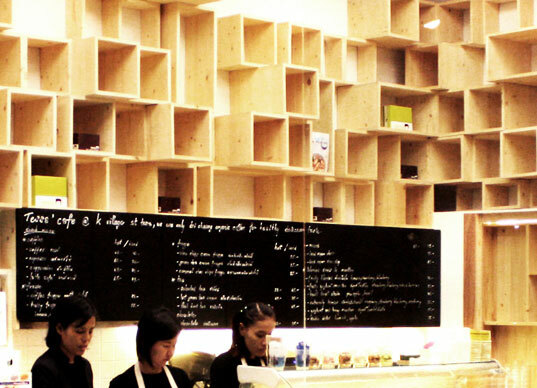 The carpenters were hired to build over 200 “Klong Toey Boxes” in a workshop, which were then installed in the gourmet food shop. The boxes were arranged on the walls to serve as displays as well as seating, lighting fixtures, grocery containers and signage. The effect, as you can see, is clean, neat and visually interesting. Hopefully this commission for the carpenters brings on more work. This is Architectkidd’s second project that involved repurposing waste into architecture, although this time they acted as facilitators in order to demonstrate how migrant and temporary labor in Bangkok can influence existing design, materials and construction practices. When searching for ideas to build out the interior of a gourmet food shop in Bangkok, Architectkidd came across a community of carpenters in the nearby slums utilizing scrap wood from shipping pallets to make small items and knick-knacks. Architectkidd was impressed with their resourcefulness as well as their carpentry skills and hired some of them to build out the interior of the shop, which happens to be in an upscale part of Bangkok. The resulting project is an interesting collection of simple, stackable wooden boxes called "Klong Toey Boxes", named after Klong Toey slum where the workers came from.